Professor Thomas Madden on the First Crusade, Jerusalem, and the “Rivers of Blood” | Andrew Holt, Ph.D.
Madden begins to do just that…calculate exactly how much blood, and thereby people killed, would need to be spilled to have crusaders wading in human blood on the Temple Mount that reached their ankles, if not their knees. He walks the reader through a number of calculations concerning how much blood each of the estimated 3,000 to 5,000 victims of the massacre could have expended during the massacre as well as the amount of blood needed to cover the Temple Mount in blood four inches high (“up to their ankles”). 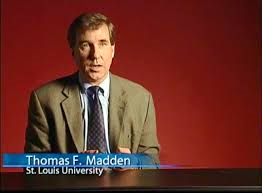 I invite readers of this blog to consider Madden’s calculation and method for themselves (see a link to the full text of Madden’s article below). As a result of these efforts, Madden provides the following conclusion. It seems to me that Madden has definitively shown that the claims of the sources, repeated seemingly endlessly by modern commentators, are physically impossible and more likely simply the product of literary imagination. Unfortunately, I doubt his fine efforts will have much of an impact on popular accounts of the massacre, but I encourage readers of this blog to read his essay for themselves, in its entirety. See “Rivers of Blood: An Analysis of One Aspect of the Crusader Conquest of Jerusalem,” Revista Chilena de Estudios Medievales 1 (2012): 25-37.